Learn about activities at the World Heritage site being undertaken in collaboration with the Department of Culture, Government of Sindh. The Centre has been set up with support from Khairpur Admin. in the historic town of Kot Diji for safeguarding Khairpur heritage and developing cultural and eco tourism. Get to know about the conservation work being carried out on the Sethi House, one of the remarkable 19th c. house, with 16th c. Mughal foundations. Heritage Foundation has been instrumental in saving several Karachi’s historic landmarks. Get to know more about the plans afoot to set up Karachi Heritage Gallery in a landmark building. Learn about the exciting findings from neglected record dating back to 1874, now being preserved in collaboration with the KMC, and the digital depository being created for research. 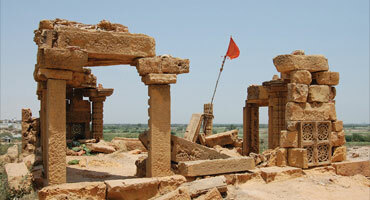 Explore the value of DRR-compliant structures and Building Back Better and Safer with Vernacular Methodologies. 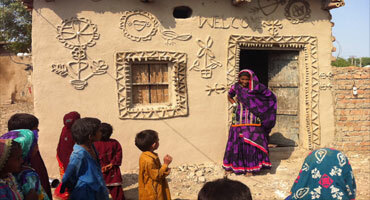 Learn about Shelter for All in Pakistan (SfAiP) using zero carbon footprint adobe/mud, bamboo and lime, and the Mobile Barefoot Karavan Teams for implementation. Get to know about construction of almost 300 Green KaravanGhar in post flood, post militancy Swat and Green Community Centre for women’s crafts and primary health. Learn about how women’s economic empowerment can be achieved through low cost methodologies for training and entrepreneurship in marginalized communities.